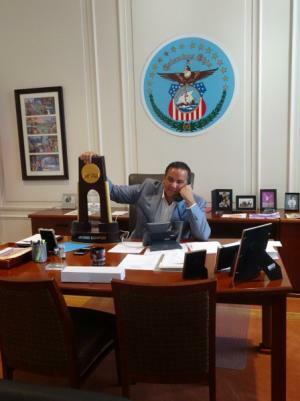 Where in Columbus is the NCAA Volleyball Trophy? It’s double duty for this week’s Trophy Tour post! Not only is Trophy sharing the good news about the NCAA Division I Women’s Volleyball Championship in December, but the Ohio High School Athletic Association (OHSAA) is hosting its third consecutive State Football Championship at the Shoe in the same month. 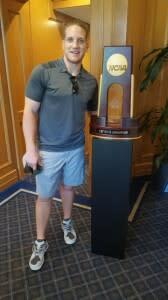 So who better for Trophy to visit than former Buckeye A.J. Hawk? Trophy spent some one-on-one time with A.J. and learned a little more about him. A.J. grew up in Centerville, Ohio and attended Centerville High School, where he was a two-time OHSAA All-State Player. He then attended The Ohio State University, where his collegiate football career is legendary! Not only was he a three-time All-Big Ten honoree, but he also one the Lombardi Award (which goes to the best linebacker in the country) and was a unanimous pick for an NCAA First Team All-American award. A.J. was drafted into the NFL in 2006, and is currently a free agent. He will be attending the OHSAA State Football Championships during the weekend of December 1-3 and is participating as an honorary captain before one of the seven championship games! Since Trophy got to learn about A.J.’s background at the OHSAA State Football Championships, she got to share a little info on the upcoming NCAA Volleyball Championship as well! A.J. and Trophy want you to know that Columbus is incredibly close to breaking the attendance record for the Championship. They both want you to help Columbus get the record, so buy your tickets today! November 10, 2016 | The NCAA Division I Women’s Volleyball Championship is a month and five days away from being in Columbus and we’re set to break the attendance record! But this week, Trophy got to meet a man that is known for a sport outside of volleyball. Ohio State basketball legend Clark Kellogg, who happens to also be a big volleyball fan. Clark’s daughter played NCAA Division I Volleyball at Georgia Tech. In addition to cheering on his daughter at volleyball matches, Clark is a notable figure and Trophy had a chance to learn more about Clark when they hung out during the Pro Am Golf Tournament a few months ago. Clark is Ohio born and raised, growing up in Cleveland and playing high school basketball at St. Joseph’s High School. He of course donned the scarlet and gray to play from 1979-1982, where he was All-Big Ten Conference and Most Valuable Player. He then moved on to the Indiana Pacers, where he was a first round draft pick and went on to win NBA Rookie of the Year honors. Clark is perhaps best known, however, for his commentary on basketball games for the Pacers and for NCAA Division I Basketball, both on the court and in-studio. He has worked for ESPN, currently works for CBS Sports and has even lent his voice to video games as a commentator. He also is incredibly passionate about his charity work. Trophy learned about the Clark Kellogg Classic held each year, which raises money for the Ohio High School Athletic Association Foundation and for other charities such as the Fellowship of Christian Athletes (FCA), the Ronald McDonald House Charities of Central Ohio and the Big Brothers Big Sisters of Central Ohio. Join Clark and Trophy in their love of collegiate athletics at the NCAA Division I Women’s Volleyball Championship on December 15 and 17! 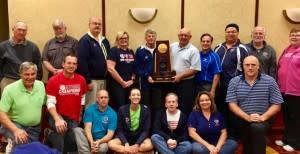 November 3, 2016 | With the high school volleyball season winding down and club volleyball tryouts about to begin, who better to show off on our Trophy Tour than the board members of the Ohio Valley Region (OVR) of USA Volleyball! Trophy knows this group quite well—she spent a lot of time at their tournaments this year! For those who aren’t as immersed in the world of club volleyball, you may be wondering—what exactly is the OVR? Trophy learned that OVR is one of the largest regional volleyball associations of USA Volleyball, the national governing body for the sport. It has over 23,000 (wow!) members as of last year which consists of both adult and youth athletes. The OVR brings many tournaments each year to Columbus’ Greater Columbus Convention Center, from its Molten Boys National Preview Tournament in December to the Kaepa Girls Volleyball Championships in May. The OVR also helped to host special events such as the USA Volleyball Girls and Boys Junior National Championships in 2012 and 2015, respectively. They also had a big role in helping bring the NCAA Division I Women’s Volleyball Championship to Columbus, and want you to help us break the attendance record! Trophy knows that the OVR Board works hard to make the region the best in USA Volleyball. Interested in learning more? Check out their website, Facebook, Twitter and Instagram! October 27, 2016 | For this week’s tour stop, Trophy headed over to John Glenn Columbus International Airport to catch a flight! While that didn’t work out too well (trophies can’t buy plane tickets, apparently), Trophy instead decided to hang out with the many visitors arriving in Columbus. For those of you who don’t know, the airport has recently gone through an $80 million renovation. Trophy got a behind-the-scenes look at some of the changes and enhancements made to the airport. From the beautiful new ColumbUS mosaic in the atrium to the new food options, shopping and redesigned terminals and the super-helpful guest information services, the airport is truly worthy of the John Glenn name. Non-Columbus natives, listen up: Trophy also learned that the airport has direct flights to over 30 cities, with new flights added regularly. Since Columbus is centrally located, many flights are less than three hours away! How convenient is that for our volleyball fans looking to come to this year’s NCAA Division I Women’s Volleyball Championship on December 15 and 17! For more info about the airport, check out their informative Facebook, Twitter and Instagram pages. Trophy can’t wait for you to experience the beautiful new airport when you arrive in Columbus! October 20, 2016 | The next stop on our tour is Columbus Recreation and Parks Department for some recreational volleyball! Trophy swung by the Bill McDonald Sports Complex to catch up with some local athletes who were preparing for a game. You’ve probably all heard the name before, but Trophy wanted to know—what exactly does Columbus Recreation and Parks do for our community? As it turns out, their mission is to provide overall wellbeing to Columbus’ residents. Their parks, programs and services give Columbus natives a chance to improve their physical and mental health, to develop our city’s youth, to focus on the environment and to make a positive economic impact on the city. One of the many ways Columbus Recreation and Parks succeeds in doing so is through its fantastic recreational sports options! From boxing to golf to pickleball to tennis, Columbus Recreation and Parks has options for all sport-lovers. And if you’re a volleyball fan, you’re in luck! Trophy learned that the fall volleyball league currently has 336 (!) volleyball teams in its rec league, played at multiple locations around the city. 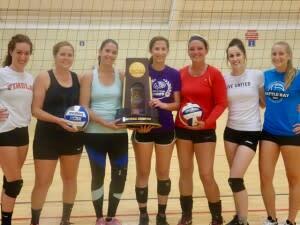 The athletes Trophy met were excited to hear about the upcoming NCAA Division I Women’s Volleyball Championships. Some even had already bought their tickets! While Fall League registration for volleyball is currently closed, registration for Winter League is just around the corner! Registration is open from Monday, December 5 to Wednesday, December 21. Don’t miss the opportunity to sign up for such a great program, and learn more about Columbus Recreation and Parks by following their Facebook and Twitter. October 13, 2016 | It’s time for a little Columbus volleyball history lesson! Did you know that the leading volleyball manufacturer in North America got its start in Central Ohio? This trailblazing company is none other than Sports Imports. 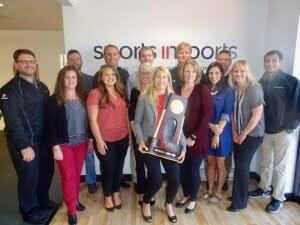 Our Trophy visited Sports Imports’ office and learned about one of the most revolutionary brands in the volleyball biz. Sports Imports was founded in the 1970s by collegiate volleyball veterans who wanted to see a change in their equipment and make playing volleyball a less potentially dangerous activity (there used to be a lot of wires involved—not good!). Trophy learned that they transformed the landscape of volleyball by cutting holes in basketball court floor and using floorplates and sleeves to secure the volleyball poles. While this technique was controversial at first, it is now common practice around the world! They recently revolutionized the industry again with their 19 pound patented all carbon volleyball pole. Sports Imports influence has now grown so much that over 90% of NCAA Division I Volleyball Programs use their equipment, as well as the American Volleyball Coaches Association (AVCA), NCAA Beach and Indoor Championships, USA Volleyball and Olympic indoor and sand/beach volleyball competition. Today, Sports Imports still maintains the pledge that they kept in the 1970s—to provide the best volleyball net system for every level of play, whether it be for a recreational beach league or the NCAA Division I Volleyball Championship, where Trophy is excited to see their world-renowned equipment in action on December 15 and 17! To learn more about Sports Imports and their tricks of the trade, go to their website, Facebook, Twitter and Instagram accounts! And don’t forget to buy tickets for the NCAA Division I Volleyball Championship, held at Nationwide Arena on December 15 and 17. 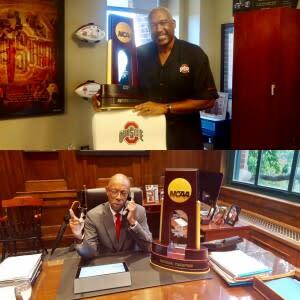 October 6, 2016 | In preparation for an Ohio State football home game this weekend, who better for Trophy to visit than The Ohio State University President Michael V. Drake and Senior Vice President and Director of Athletics Gene Smith? 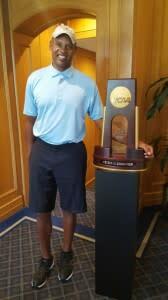 The first stop was to Gene Smith’s office in the Fawcett Center, where Trophy got a look at the inner workings of one of the nation’s most successful collegiate athletic departments. Gene expressed his excitement for the upcoming NCAA Division I Volleyball Championship that his staff is working incredibly hard in hosting at Nationwide Arena on December 15 and 17. The next stop was to President Drake’s office in Bricker Hall on Ohio State’s main campus. In addition to informing him on all the upcoming sporting events in Columbus, Trophy helped him answer a few important phone calls and emails during the visit! Right now both President Drake and Gene Smith are preparing for the Ohio State football game against Big Ten rival Indiana, which will be held at The Shoe this upcoming Saturday. They also want to encourage you to buy tickets for the upcoming Volleyball Championship, and do it soon—seats are going fast! Thanks again to these to great men for letting Trophy visit, and GO BUCKS! September 29, 2016 | This week Trophy didn’t have to move an inch! Nicki Meyer Dennis, a lover of collegiate volleyball who knows what it’s like to battle for the Championship (she played at Georgia Tech from 2009-2012), stopped by to say hi to Trophy. She even wore her Georgia Tech letterman’s jacket on her visit–brings back memories, right Nicki? We know you’re thinking to yourself: is Trophy getting so popular that it is now getting visits to its home? We’ll certainly let you think Trophy is that popular but also, Nicki is President and CEO of AccelWELL, a corporate fitness organization that aims to provide the resources needed to encourage all employees to make a commitment to health and wellbeing through personalized attention and service designed to inspire. AccelWELL is part of the Experience Columbus and Sports Commission family, so Nicki stopped by during a Wellness Committee meeting to chat all things wellness (and get a picture with Trophy of course)! Nicki understands the importance of being active, regardless of the sport or activity you choose. During our conversation with her she encouraged all volleyball fans buy those NCAA Division I Women’s Volleyball Championship tickets before it’s too late! Thanks to Nicki for visiting, and make sure to check out AccelWELL on their Facebook, Twitter and Instagram pages. September 22, 2016 | Where to next on our Trophy’s tour of Columbus? There’s no better stop for a volleyball fan than to St. John Arena for The Ohio State University Women’s Volleyball team’s practice! The Buckeyes, currently ranked No. 17 in the country, were busy practicing before they begin their Big Ten Conference play this weekend. Amazingly, eight out of the top 25 teams in the country are from the Big Ten. 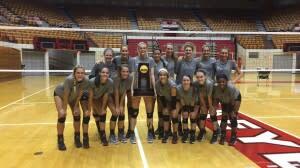 The Buckeyes still managed to find time to spend with Trophy and share their excitement for the upcoming NCAA Division I Women’s Volleyball Championship at Nationwide Arena (hey—have you bought your tickets yet? ), where Ohio State is the host institution. In fact, the team opens their Big Ten play against two teams ranked inside the top three. The Buckeyes start by facing No. 3 Wisconsin on Friday (September 23) before clashing with No. 2 Minnesota Saturday (September 24) evening. Trophy loved spending time with the team and wants you to follow the Buckeyes on their Facebook, Twitter, Instagram and website! September 15, 2016 | Today we continue touring Trophy around Columbus, and what better people to spend it with than the NCAA Division I Women’s Volleyball Committee! The committee, who is responsible for selecting the event host cities and executing the Division I Women’s Championship, held a site visit this week to discuss logistics. Even though they were only in the city for two days, the sports commission made sure to get in some fun in between site visit responsibilities. Insert Trophy! 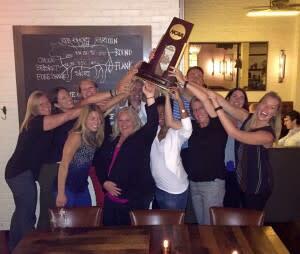 During dinner with the committee at The Pearl in the Short North Arts District, Trophy made its appearance and we couldn’t help but task the committee to hoist Trophy up just like the winning team does at the Championship. Full of delicious appetizers, unforgettable dinner and belly-stuffing desserts, the committee left Columbus. Although Trophy was sad to see them go, they will be back in December when the NCAA Division I Women’s Volleyball Championship unfolds at Nationwide Arena. You have your tickets, right? September 8, 2016 | The next stop on Trophy’s tour is the site of the 2016 NCAA Division I Women’s Volleyball Championship, Nationwide Arena! Located in Columbus’ Arena District, this 18,500-seat facility has been home to the Columbus Blue Jackets since 2000. The team starts their preseason at the end of the month. When Trophy visited, the Arena was getting ready to host open practice for Team USA, who are using the facility for their training camp for the World Cup of Hockey September 5-9. Hockey games aren’t the only events that happen in Nationwide Arena, however. The venue hosts other events such as the Dixie Chicks concert in September, the Kellogg’s Tour of Gymnastics Champions in October and (of course!) the NCAA Division I Women’s Volleyball Championship in December. September 1, 2016 | As Columbus prepares for the NCAA Division I Women’s Volleyball Championship and gears up for more than 30,000 fans, coaches, officials and the top four volleyball teams in the country, the NCAA Volleyball trophy (appropriately dubbed “Trophy”) will also be in Columbus for the Championship. 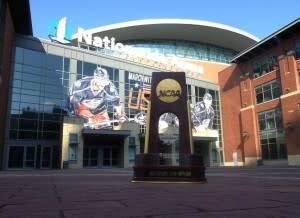 In fact, Trophy is already here in Columbus in anticipation for the event. So far, Trophy has been spending its summer at many youth, collegiate and professional volleyball events throughout the city. Trophy made appearances at Ohio Valley Region and Junior Volleyball Association boys and girls volleyball tournaments in the Greater Columbus Convention Center, stopped by the National Volleyball League beach tournament at Flannagan’s Dublin and will visit Ohio State Women’s Volleyball and Capital University Women’s Volleyball tournaments this weekend at Nationwide Arena and the Capital Center, respectively! However, Trophy is just getting started! It will be spending time with the who’s-who and the where’s-where of Columbus this fall in preparation for the Championship. In fact, we invite you to follow Trophy to see where he will end up this fall. Every Thursday at 10 a.m., check Columbus Sports Scene Blog and our Facebook, Twitter and Instagram pages to see where it ends up next. And you never know, Trophy might even be handing out some tickets to the Championship during his tour. So who did Trophy visit first? Why of course it was the Mayor of Columbus– Andrew J. Ginther! Trophy even took it upon itself to help the Mayor answer a few phone calls, perhaps preparing for its next gig when done touring Columbus? During the visit, Mayor Ginther was impressed to learn that tickets to the Championship are selling fast (hint, hint- buy your tickets today)! Where will the trophy go next? Make sure to check this blog every Thursday! You’ll never know where it might end up. If you have a good idea for the trophy’s next location, send us a tweet or post a comment.